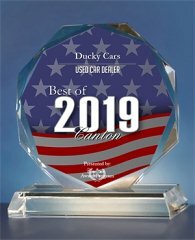 Ducky Cars prides itself by offering the best quality used cars, trucks, SUVs, and vans out of all dealers in Canton, GA. ALL CREDIT ACCEPTED - GUARANTEED CREDIT APPROVAL. Forget the stress of a credit check, we let your job be your credit. We also service what we sell, which is part of our goal to enhance the level of customer satisfaction. We pay top dollar for your current car in trade. We will send your vehicle to you if you are in a different state. In addition, we offer an CARFAX vehicle history report on every car we sell. Look us up on FaceBook at https://www.facebook.com/duckycars/. Our customers leave happy. Stop by today to find out what we can do to get you in the vehicle of your choice.